of Woburn, April 8, 2018. Beloved wife of Paul G. Noble. Loving mother of Paul H. Noble, his wife Patricia of Tewksbury, Laura A. Noble, her wife Marie Montgomery, and Jeffery J. Noble, his wife Kerry, all of Townsend. Dear sister of Joseph Muscato, his wife Mary of Watertown, Maryann Muscato of Concord, Ruth Brooks, her husband James of Nebraska, and the late, Peter Muscato. Cherished grandmother of Stephen, Brandan, Taylor and Dylan. A Funeral will be held from the Lynch-Cantillon Funeral Home, 263 Main Street, Woburn on Friday, April 13th at 9 a.m., followed by a Mass of Celebration in St. Barbara’s Church, 138 Cambridge Road, Woburn at 10. Interment in Woodbrook Cemetery. Relatives and friends are respectfully invited to call at the Funeral Home, Thursday from 4-8 p.m. For directions or to leave an online condolence, please visit www.lynch-cantillon.com or Facebook under Lynch-Cantillon Funeral Home. 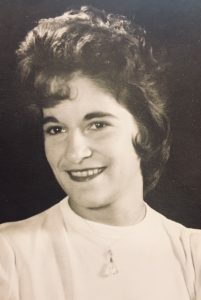 Antoinette “Toni” M. (Muscato) Noble – a longtime resident of Woburn, died peacefully, Sunday April 8th at Winchester Hospital. She would have celebrated 55 years of marriage on April 28th with her beloved husband, Paul G. Noble. Born and educated in Concord, Toni was a daughter of Joseph and Mary (Cotoni) Muscato, and a graduate of Concord High School. For over 20 years, Toni worked as a billing clerk for Dr. Cutler in Woburn. Toni was a loving, generous and selfless woman with a huge heart. Her family meant the world to her and she would do anything for them. She enjoyed taking trips with her husband to Mohegan Sun and spending time at their house on Cape Cod, where she enjoyed relaxing and tanning by the ocean. Her favorite time was spent at home sharing her love and great cooking with her family and grandkids. She also enjoyed reading and solving crossword puzzles. Along with her husband Paul, Toni was the loving mother of Paul H. Noble, his wife Patricia of Tewksbury, Laura A. Noble, her wife Marie Montgomery, and Jeffery J. Noble, his wife Kerry, all of Townsend. Dear sister of Joseph Muscato, his wife Mary of Watertown, Maryann Muscato of Concord, Ruth Brooks, her husband James of Nebraska, and the late, Peter Muscato. Cherished grandmother of Stephen, Brandon, Taylor and Dylan. A Funeral will be held from the Lynch-Cantillon Funeral Home, 263 Main Street, Woburn on Friday, April 13th at 9 a.m., followed by a Mass of Celebration in St. Barbara’s Church, 138 Cambridge Road, Woburn at 10 a.m. Interment in Woodbrook Cemetery. Relatives and friends are respectfully invited to call at the Funeral Home, Thursday from 4-8 p.m. For directions or to leave an online condolence, please visit www.lynch-cantillon.com or Facebook under Lynch-Cantillon Funeral Home.